The Icelandic electricity grid is highly modern and extraordinarily reliable and the Icelandic Transmission System Operator, Landsnet, is world-renown for its secure electricity supply to its customers. This fact has been confirmed in numerous international reports, where Iceland’s electricity supply is ranked among world’s most secure (see for example IMD’s and WEF’s World Competitiveness reports). Landsnet owns and operates all bulk electricity transmission lines as well as all main substations in Iceland. The company is owned by four electricity generating companies, where the state-owned power company Landsvirkjun has almost a 65% share. The total length of the transmission lines is currently close to 3,200 km. The power flow is always illustrated in real time on Landsnet’s website. To meet growing demand, the grid is constantly being developed and maintained at a high standard, which includes rebuilding older lines and adding new ones. The grid is free of serious bottlenecks and there are no permanent system constraints in Landsnet’s grid. Although Iceland is already the world’s largest electricity producer per capita, the country has substantial hydro- and geothermal resources unharnessed. This includes numerous very economical options, with minimum environmental effects. According to a special governmental plan for energy (Master Plan for Hydro and Geothermal Energy Resources) several new renewable energy projects can be expected in Iceland in the forthcoming years. This will call for major investments, not only in electricity generation but also in the construction of new transmission lines. Recently, Landsnet introduced its vision or ideas towards strengthening the grid (as shown on the map above, with the title Next generation grid). However, this is a plan that the company will develop in full accordance with the Icelandic government and its energy policy. 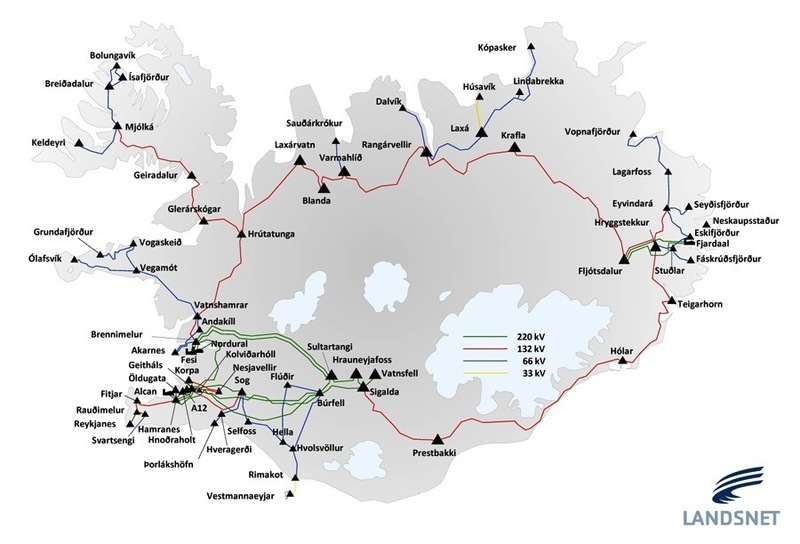 It is expected that the Icelandic parliament (Alþingi) will soon vote on the Master Plan, making it clear which new energy- and transmission projects will be emphasized in the coming years. 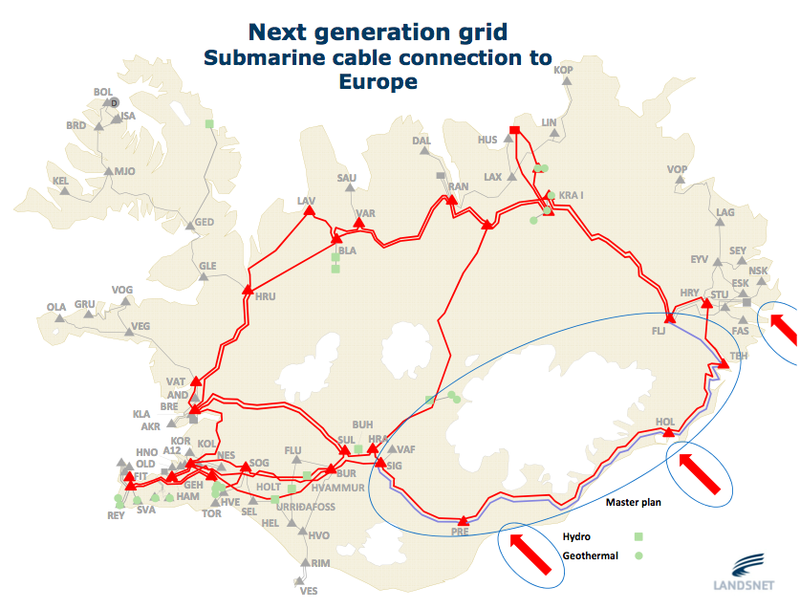 In addition to the expected build up in the Icelandic transmission system, a high voltage direct current cable (HVDC) is currently being considered between Iceland and Europe. Such a cable would obviously affect the Icelandic TSO. In early July (2012) the Icelandic Minister for Industry, Ms. Oddný Harðardóttir, appointed a working group to scrutinize the feasibility of such a interconnection. Of course Landsnet has a representative in this group, which will look carefully at all the relevant issues, such as the technical, financial, legal and social aspects. However, the next major step for Landsnet is not regarding the transmission system, but has to do with the electricity market. Within a couple of months, Landnet will be establishing a new efficient electronic market for electricity trading. We at Askja Energy will soon be taking a closer look at this new Icelandic electricity market, that will have strong similarities to for example the Elbas Intraday Market at Nord Pool Spot.